New Map of that portion of North America exhibiting the United States and Territories, the Canadas, New Brunswick, Nova Scotia and Mexico, also, Central America and The West India Islands. One of the most interesting and attractive 19th century wall maps of North America. 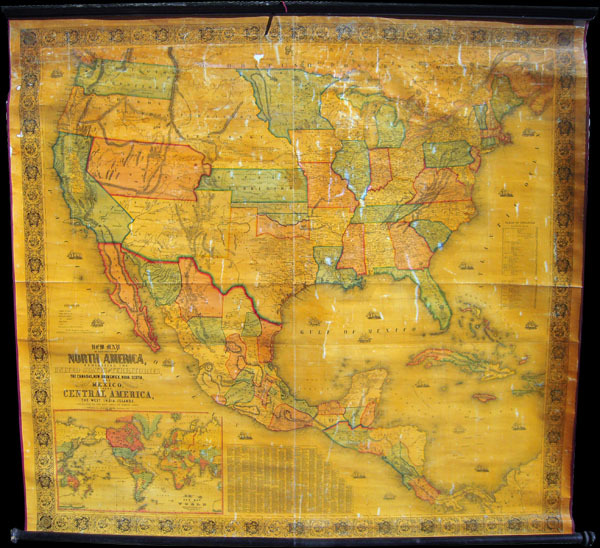 Published in 1854 by Jacob Monk, this large and beautiful wall map, details much of North America from the southern border of Canada to Central America, the West Indies, and the northwestern parts of South America. Details the United States in full as well as parts of modern day Canada. Shows North America during an important period of territorial and cultural expansion following the Mexican-American war and during height of the California Gold Rush. The California Gold Region around Sacramento, nestled between the Sierra Nevada's and the Coastal Ranges, is highlighted in bright yellow. Despite Monk's bold highlight of the Gold Region it remains surprisingly inaccurate. Monk places Auburn well north of Sacramento between Marysville and Yuba City. Shows the western territories as they existed at the time with New Mexico extending from California to Texas, Utah reaching from California to Kansas, and Washington and Oregon extending eastward to Nebraska Territory. Nebraska Territory itself is shown at its fullest extent from Kansas to the border with British America (Canada). Oklahoma is divided up among three American Indian Nations, the Chah-Lah-Kee, the Muscogee, and the Chah-Ta. Also names numerous other American Indian tribes throughout. Shows several wagon routes and proposed railroads, as well as springs, mountain passes, forests, swamps, and deserts. Attempts to illustrate the shipping lanes along both the east and west coasts with numerous vignettes showing sailing ships. A large inset map in the lower left quadrant shows the world on a Mercator Projection. To the right of this is a chart detailing the towns and counties of the United States. Surrounded by an elaborate decorative border with a floral, almost baroque motif. This is the fourth state of Monk's map which was first published in 1854. Monk issued two variants of this map in 1854, an earlier version that, similar to the 1853 issue, showed Nebraska as 'proposed Territory of Nebraska' and this version, issued following the ratification of Nebraska Territory in May of 1854, which drops 'proposed' and ads a note regarding the establishment of the territory. All in all an extremely beautiful and interesting wall map of North America. This is the kind of map that can stand up to lengthy perusal. Jacob Monk (fl. c. 1850 - c. 1860) was a Baltimore based American publisher of wall, pocket, and case format maps active in the mid-19th century. While Monk's maps are quite popular and enjoyed a wide distribution in the 19th century, little is known of his personal life or history. Good condition. Generally speaking this map is in great condition for a larged unrestored wall map. No major stains or discolorations, no missing zones, and minimal crackling and whitening. Partial restoration with contemporary edging. A great opportunity to own a Monk map with out the need to invest thousands of dollars in restoration. Wheat, C. I., The Maps of the California Gold Region, 1848-1857, a Biblio-Cartography of an Important Decade, 243. Wheat, C. I., Mapping of the Transmississippi West, 1540-1861 (5 vols), 757 (1854 ed.) 794 (1853 ed.). Rumsey, 602.